Cbeebies Alphablocks is a fantastic phonics-based children’s series from the BBC. It is aimed at P1-P3 – three-to-six-year-olds and is great if accompanied with the comprehensive phonics programme also available on this site. All of the episodes are accessible from the interface in this link. A ‘key’ to each of the shows – detailing the themes and sounds covered – is below. It can also be downloaded as a double-sided Word Document to distribute to parents. I know them all by name-o. Interactive Powerpoint game template by Rufus. A game to practice blending 2 and 3 syllable words; insert your own words. This is an interactive game from the Waygook.org community in South Korea. Click here for more. Below is an ‘off-the-shelf’ curriculum-based Phonics Programme developed for Chinese-speaking KS1 learners. 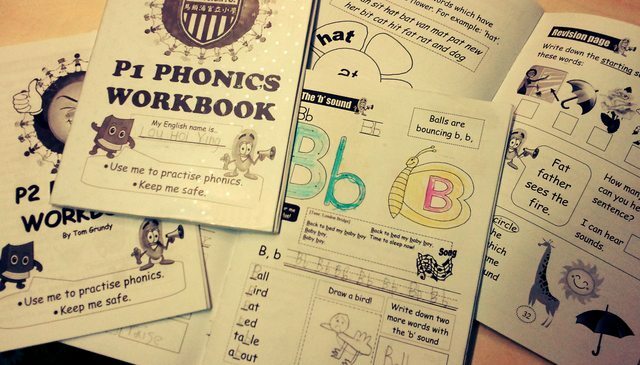 There is a P1, P2 and P3 set of Powerpoints and workbooks, all include copies of the Phonics Alphabet and Phonics Song and are based on the Education Bureau’s Scheme of Work using proven teaching methods. The P1 programme includes sight words, songs, poems, tongue twisters, jazz chants and stories in context with a focus on initial sounds. It incorporates ‘Angry Phonics’ animations created by a fellow teacher in Hong Kong. P1 Phonics Programme Accompanying Workbook – 4.8mb, 40 pages. P2 Phonics Programme Powerpoint – 17mb, 237 slides. The P2 programme includes minimal pairs (a/e, b/p, d/t, r/l, f/v – all easily confused by Chinese speakers), animated 3-letter blends (a, e, i, o, u), long and short vowel sound activities, short vowel sound animated word families (a, e, i, o, u), animated diagraphs (ch, sh, th, ck) and Magic/Silent ‘e’. P3 Phonics Programme Powerpoint – 17mb, 201 slides. The P3 programme includes animated initial consonant clusters/blends (bl/br, cl/cr, fl/fr, gl/gr, pl/pr), long vowel spellings (‘ai’, ‘ay’, ‘a_e’ / ‘ee’, ‘ea’, ‘e_e’ / ‘ie’, ‘y’, ‘i_e’, ‘igh’ / ‘oa’, ‘oe’, ‘ow’, ‘o_e’ / ‘ew’, ‘ue’, ‘u_e’), plural forms (‘s’ or ‘es’), irregular plurals, final consonant clusters (-it, -mp, -nd, -mb, -ing, -ng, -x) and past tense ending sound pronunciation. P3 Phonics Programme Accompanying Workbook – 2.8mb, 24 pages. Parent’s Workshop – 3.6mb, 36 slides. A Powerpoint on home reading with a focus on phonics/decoding. Includes a double-sided handout below. Designed as an hour-long workshop in English and Chinese. Contributions from fellow HK teachers Tanya Hart, Dawn Jones-D’Abreu, Rachel Winston, Daniel Levia & Ron Kordyban. Parent’s Workshop Accompanying Handout – 0.2mb, 2 pages.